Role: Greeters greet parishioners and visitors as they enter the church before Mass and other church services to provide them with a warm welcome help them fell a part of our parish community. 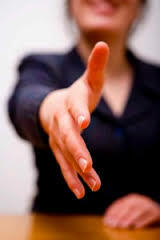 Personal Qualities Needed: A welcoming and friendly demeanor is needed for a greeter. Greeters are sometimes called upon to distribute information as people arrive such as our annual Mass count sheets or other info necessary for that particular event.